My favorite Mexican restaurant adds pickled red onion to their pork tacos so when my husband mentioned making pulled pork for dinner I immediately went online to locate a recipe. Through my search I found a number of recipes for pickled red onions but also pickled cucumbers. And so, I set out to experiment with flavors and came up with a delicious recipe. 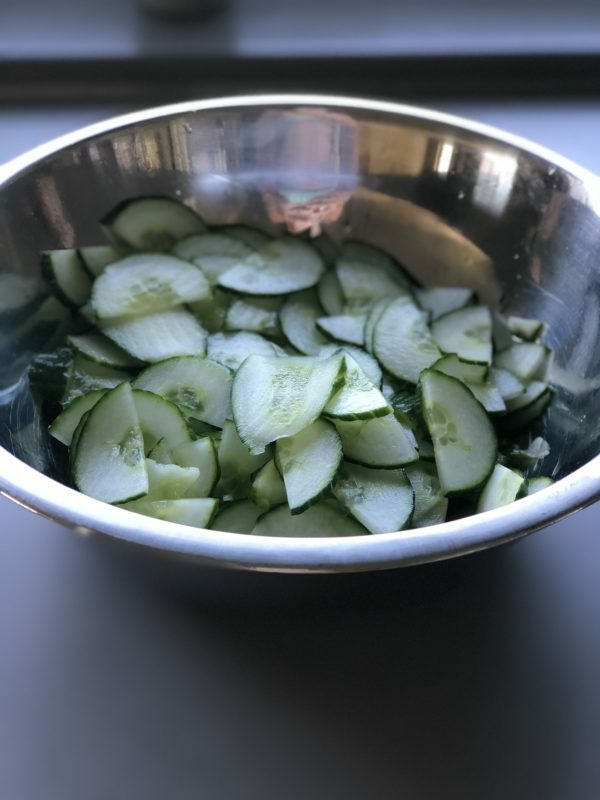 I love these pickled cucumbers because they are mild and provide a delicate and delightful flavor to any dish. Pickled cucumbers are delicious on pulled pork sandwiches, perfect on a veggie wrap, a topping to any salad, and a flavorful side dish when combined with cherry tomatoes and served with blackened grouper or mahi. 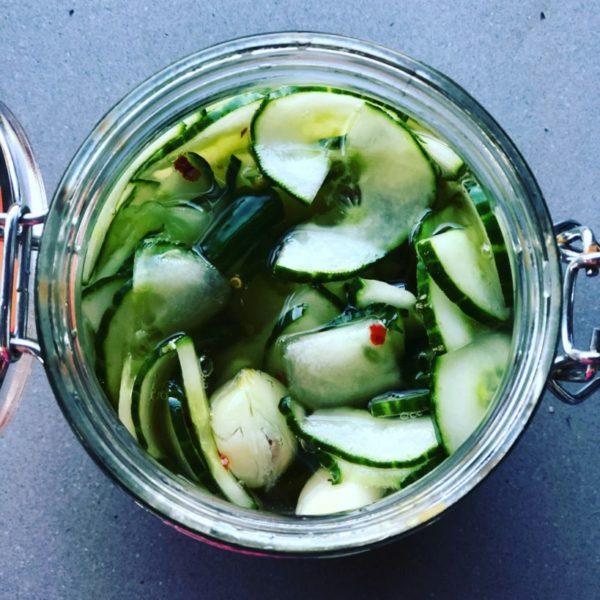 Pickled cucumbers provide a perfect amount of acidity, sweetness, and texture to any dish. These cucumbers are crisp and refreshing and will surely be a staple in my refrigerator. Tangy, refreshing, crisp. This is the perfect way to describe pickled English cucumbers. They are a great condiment to any dish. Skip the mayo and mustard and add this to your sandwich, salad, and as a tasty side dish. Slice the cucumber thinly (use a mandoline or vegetable slicer if you have one). Place the sliced cucumber in a colander, toss with a little kosher salt, and let stand for 30 minutes. 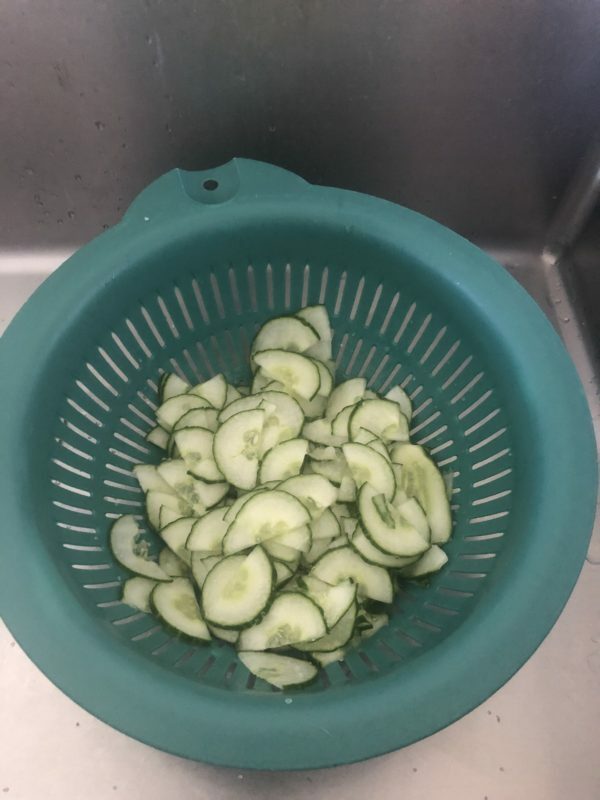 Place the sliced cucumber in a colander, toss with a little kosher salt, and let stand for 30 minutes. 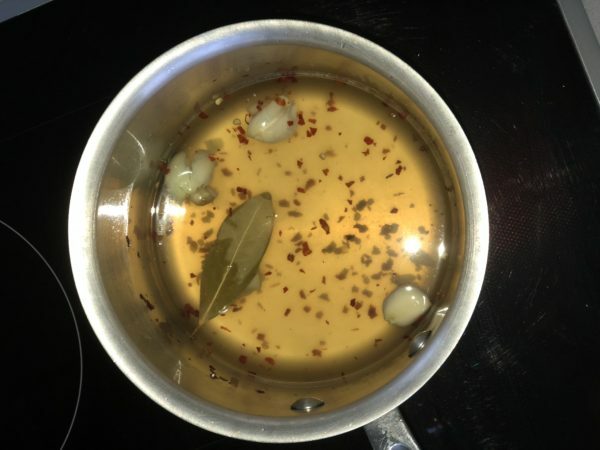 Combine water, vinegar, sugar, bay leaf, red pepper flakes, and garlic in a medium saucepan. Allow to come to a boil. Remove from heat and let cool. Rinse the salt off the cucumbers and squeeze out as much moisture as possible. I used a salad spinner to remove excess water. 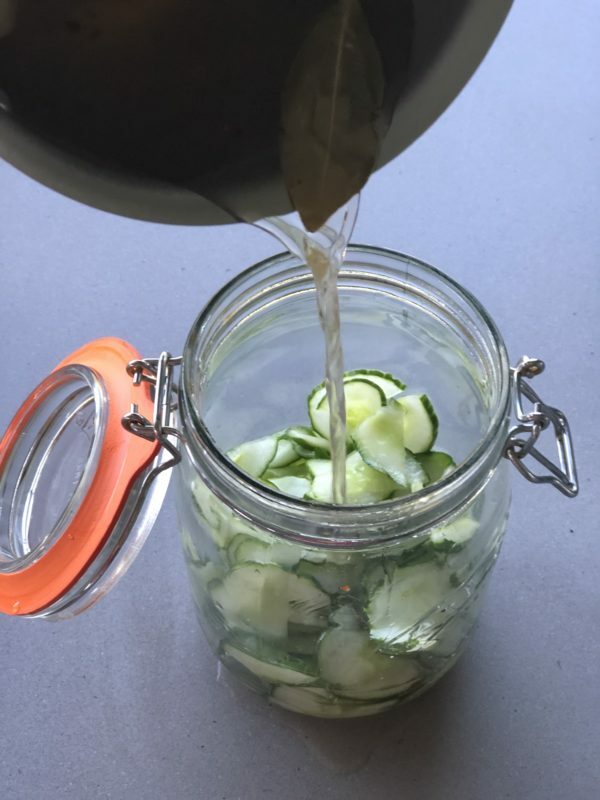 Add the cucumbers to a large mason jar (or container of your choice that has a lid) and pour the pickling solution over the cucumbers. 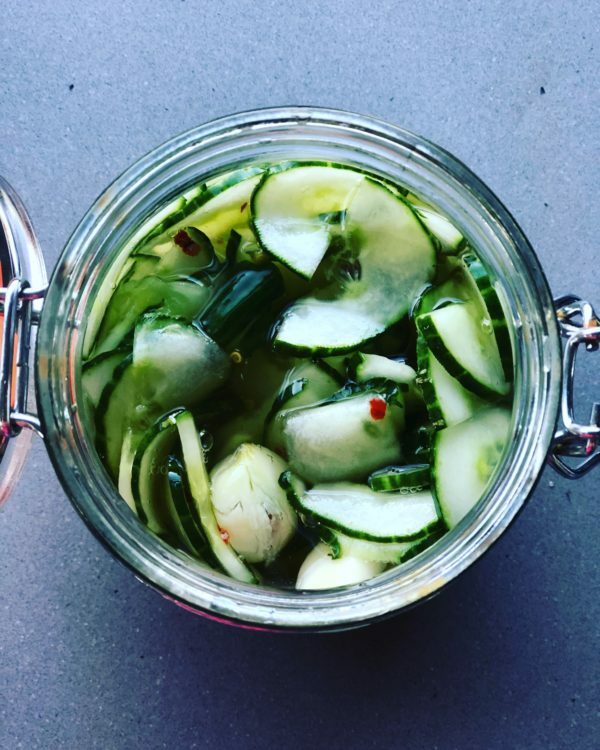 You should completely cover the cucumbers with the pickling liquid (brine). Cover and refrigerate for 3 to 6 hours before serving. The pickled cucumbers will keep in the refrigerator for up to 5 days.